A South Bay neighborhood is on edge and a family is mourning the loss of a beloved pet cat after a coyote attack early Monday morning. The attack, which was captured on home surveillance video, occurred on Trumball Court in Sunnyvale, where neighbors said they've never seen coyotes wandering the streets before. People who've lived in the neighborhood for years said if it wasn't for the surveillance footage, they never would have believed it. "It's really bizarre, and I think animal control needs to look at it because you see missing cats everywhere," neighbor James Allen said. 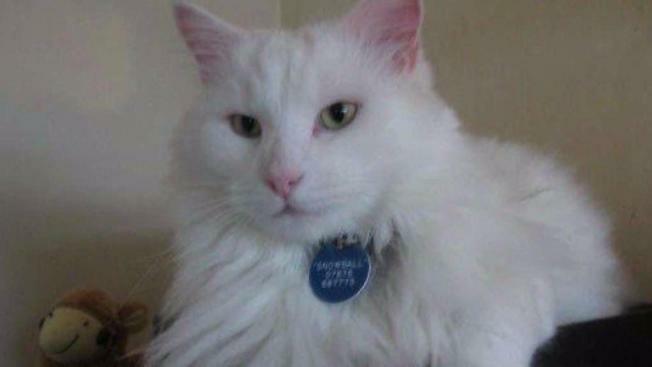 Lisa Callan on Monday buried the remains of Snowball, her 14-year-old cat that moved to the Bay Area with her family from the U.K.
"Snowball is a bit of a celebrity," Callan said. "He's an outdoor cat. Everybody who walks by strokes him. He's going to be really missed." In the surveillance video, Snowball can be seen lying in the street with at least one coyote nearby. Moments later, the pack drags the cat's lifeless body across the street. "Devastated," Callan said. "It's just a really horrible, horrible way to go. I just can't believe it really." Peter Tira of the California Department of Fish and Wildlife said, despite several recent reports in multiple Bay Area cities, the agency hasn't noticed a significant increase in coyote sightings or attacks. He said coyotes are common to the area. "We have to understand that pretty much all of California is coyote habitat, so they're pretty much everywhere in the state," Tira said. That means pet owners need to keep an eye on small pets every time they're outside and bring their food and water inside, Tira said. Callan agreed, saying she hopes sharing her story will help keep other pets safe. "For now people, you know, please keep your animals in as soon as it's dark till at least 7 or 7:30, I would advise," Callan said. "Keep them safe."